In only one start in the Indy 500, JR Hildebrand's first race finish at this monumental event was more thrilling than that of many long-running veterans. Having driven a competitive race for almost the entire 500 miles, Hildebrand and the his #4 Panther Racing team had the race playing into their hands on fuel economy. Possessing the first place position, it actually appeared this 23-year old rookie from California could have won. Facing the likelihood he could equal a result earned by the 2000 Indy 500 rookie Juan Pablo Montoya, Hildebrand would lose his dream when his race-leading Dallara swung into the wall on turn 4 coming to the checkered flag. Skating along the wall, JR Hildebrand's momentum did deliver the Panther Racing car to 2nd place. Though the end result had JR Hildebrand feeling the emotions of letting a race win in the biggest INDYCAR event slip away, the runner-up run was still a phenomenal effort for a rookie driver at the grueling Indianapolis Motor Speedway. Realizing that achievement, JR Hildebrand received the coveted Indy 500 Rookie of the Year award. As I stated before in this blog site, drivers can have more than one chance as the Indianapolis 500 victory lance but receive just a single chance to earn the Rookie of the Year award. Five rookie contenders were eligible for the 2011 Indianapolis 500 award to honour the best efforts for a first-time driving an IZOD INDYCAR around the 2.5 mile Brickyard. With the media grading drivers through practice and qualifying as well as the race, the 2011 award was believed to be a two-way fight between JR Hildebrand and Newman/Haas Racing's Canadian rookie James Hinchcliffe. After Hinchcliffe's crash with the wall just past the halfway distance of 200-laps, Hildebrand appeared to only need to keep his Panther Racing car on track in order to lock up the rookie of the year honours. Apologetic to his race crew after the crash, Hinchcliffe would register 29th in the final race standings. A rookie finishing one spot worse than James Hinchcliffe, British driver Jay Howard's race was ended due to a faulty installation of a rear wheel attributed to an air gun failure. Once the wheel flew off his Rahal Letterman Lanigan Racing #88 car, Howard lost control coming out of the pit lane on lap 60 smashing hard into the inside track wall. Howard was unhurt. "Everyone worked really hard. I had a great car. I was loving every minute of it. We were making our way through the field. I think I got as high as 12th or 13th. The car felt really good." Howard said disappointed with his end result but very satisfied to have finally run his first Indy 500 race. Experiencing less dramatic days, the remaining rookies Charlie Kimball and Pippa Mann were ultimately not factors for the Indy 500 win in 2011 but it succeed in an important discipline at the Indianapolis Motor Speedway finishing the event. Driving for Chip Ganassi Racing, Kimball came across the line 13th as the first car one lap down. British driver Pippa Mann, piloting one-off effort for Conquest Racing, took her #36 car to 20th place. 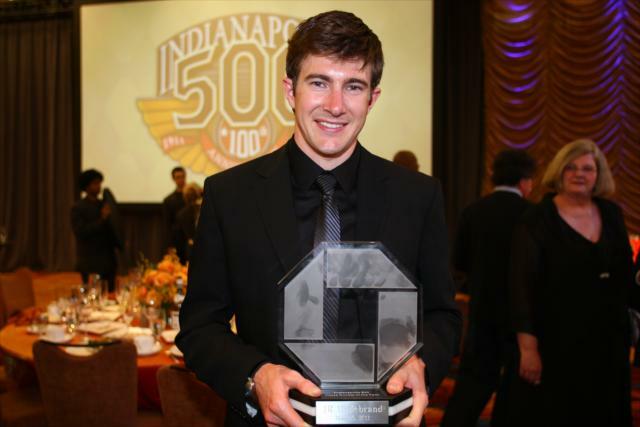 At the annual post Indy 500 gala, JR Hildebrand proudly accepted the Chase-sponsored Rookie of the Year trophy. Hildebrand will attempt to follow up the top rookie at the 2011 Indianapolis 500 honours with this year's IZOD INDYCAR Series award.